John Paterson, 1868. 3-storey 5-bay public house in irregular terrace. Squared and snecked bull-faced sandstone with polished dressings (painted to ground floor). Base course; cornice to ground floor, polished band above with carved beehive motive to centre; moulded band between 1st and 2nd floors stepping up over carved date panel to centre; bracketed projecting cills to 2nd floor windows and moulded surround to centre; moulded eaves cornice. Pilastraded ground floor; timber panelled door in modern decorative surround to centre, timber panelled door to outer right; crowstepped gable to centre bay with rendered apex stack and thistle finial (formerly chimney with cans). 12-pane glazing to ground floor windows; modern glazing above. Grey slates. 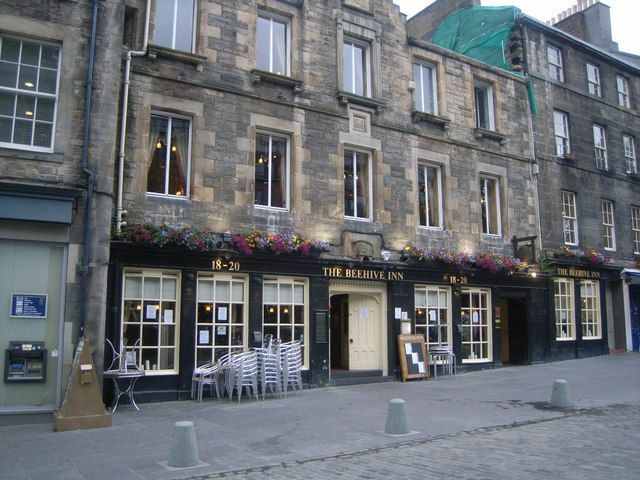 The long rectangle of Grassmarket was already a suburb and a secondary market place by 1500. After the Battle of Flodden in 1513 the city walls were strengthened and the Grassmarket and Cowgate enclosed by the Flodden Wall. Agricultural produce was sold in the Grassmarket until well into the 20th century; old photographs show up-ended carts and the bars and hostels associated with the market (including the Beehive Hotel). It was also a place of public execution.